Manheim is North America’s leading provider of vehicle remarketing services, connecting buyers and sellers to the largest wholesale used vehicle marketplace and most extensive auction network. Through 125 traditional and mobile auction sites and a robust digital marketplace, the company helps dealer and commercial clients achieve business results by providing innovative end-to-end inventory solutions. Approximately 18,000 employees enable Manheim to register about 8 million used vehicles per year, facilitate transactions representing nearly $57 billion in value and generate annual revenues of more than $2.6 billion. Manheim’s auction properties can contain upwards of 20,000 vehicles on location at a time. Knowing the location of each vehicle on the property is essential, since vehicles are frequently moved through the various services on the property (e.g. mechanic shop, detail shop, etc.) and need to be prepared for sales day at the auction. To identify vehicle location, twice per day employees would walk around the property and manually scan every single vehicle and input its lot location - a numbering system to segment areas of the property (e.g. Lot 400). Not only is this process manual and therefore time and labor intensive, but it’s also prone to human error (i.e. accidentally putting in the wrong lot location), it’s imprecise, and it isn’t real-time. If a vehicle is scanned then moved 20 minutes later, it’s lot location could be out of date for hours, until it’s scanned again. Without real-time location, the crews that move the vehicles can spend hours looking for a single vehicle among the thousands on the property. Before a sales day, the crews might be working until as late 2am to hunt down all the vehicles and get them where they need to be. If vehicles can’t be found, they can’t be sold, directly impacting Manheim’s bottom line. Manheim needed a way to track the precise, real-time location of all the vehicles on their many properties. While GPS trackers seems to be the obvious solution, there remained several challenges that had prohibited solutions in the past. A tracker would need to be inexpensive, because of the sheer volume of vehicles. It would need to last over a year on battery, otherwise the operational burden of replacing dead trackers wouldn’t be worth it. And it would need to have long-range connectivity, given the size of the properties. By using proprietary, custom-built hardware and a Low Power Wide Area (LPWA) network for connectivity, the trackers are able to last over a year on battery life while providing real-time location with under 2 meter accuracy. A single LPWA gateway can provide over 1km of range, and multiple gateways can be installed to extend coverage (e.g. if there is a satellite location where additional vehicles are stored). All of the tracker data flows over the network to the Leverege Platform, where it’s transformed and visualized in a purpose-built interface for Manheim. Employees can access the interface as a web-app, meaning that employees can seamlessly use the interface on their mobile devices, tablets, and desktops regardless of their operating system (iOS vs. Android, Mac OS vs. Windows). Within the interface, Manheim employees can search for individual vehicles or groups of vehicles and instantly access their location in real-time. Managers can also send texts or emails to vehicle crews with links to directly open the interface, enabling them to quickly find vehicles and make sure they’re where they need to be. In addition to solving a deep pain point and drastically decreasing operational burden and labor costs at Manheim, the solution also has the ability to unlock significant future value. The Leverege Platform is designed to be extremely open and therefore easily integrated into current systems and processes. This enables the location data to flow into Manheim’s operations to provide unique and valuable insights and automations. For example, planned expansions include the ability to monitor and perform analytics on vehicle flow through each of Manheim’s services to allow them to optimize operations and resource allocation. 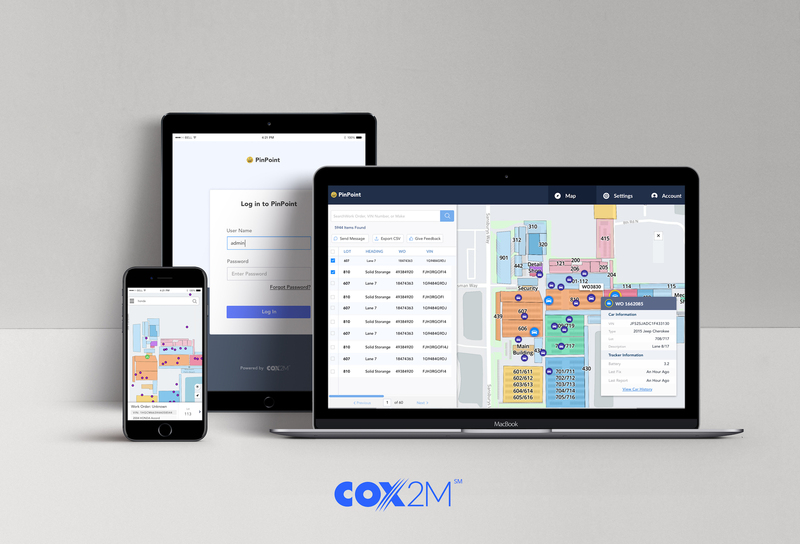 The Cox2M solution, powered by Leverege, is an exciting example of how new IoT technologies can solve acute challenges while unlocking tremendous additional value. This asset tracking solution also represents the largest LPWA commercial IoT deployment in North America with over 500,000 assets being tracked. "After an extensive survey of the market, we chose Leverege as our IoT platform partner and system integrator. Their flexible and modular technology, advanced analytics, and the world-class team that stands behind the products made them an easy choice." Josh Sommer, Executive Director of New Growth Strategy atCox Communications. Manheim brings together qualified sellers and volume buyers of used vehicles that include automotive dealerships, banks, car rental agencies, car manufacturers and government agencies.